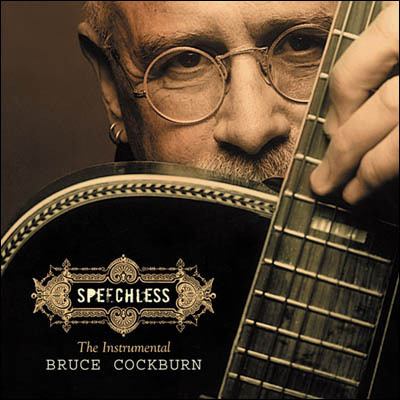 Bruce Cockburn - News Archive - Speechless: The Instrumental Bruce Cockburn, Coming 09/27/2005! 24 August 2005 - Bruce is coming out with a new instrumental album and starting a solo tour soon, here is some information provided by True North Records and Rounder Records. So pronounced is Bruce Cockburn's reputation as a celebrated singer-songwriter that it's easy to overlook the fact that Cockburn is also an exceptional guitarist. Speechless should change all that. A collection of previously recorded and brand new instrumental tracks, the album puts the spotlight squarely on Cockburn's brilliant acoustic guitar playing. Despite its absence of words, Speechless is highly expressive. Ranging from some of his earliest numbers to three recent compositions, the album showcases the breadth of Cockburn's eclectic guitar style. There's a strong cinematic quality to much of the album, whether it's in pieces from the 1970s like the haunting Islands in a Black Sky and the cascading Water into Wine, or else in 1990s instrumentals such as the emotional When It's Gone It's Gone and the ambient Mistress of Storms. The new instrumentals on Speechless include the meditative Elegy, played on the dobro and the circular The End Of All Rivers. On the latter, Cockburn makes use of an echo effect that allows him to harmonize with the melody as it progresses. Another piece came about when co-producer Colin Linden wanted more blues on the album and suggested a new version of Mama Just Wants to Barrelhouse All Night Long. Cockburn wasn't so sure. But he remembered a piece that had its origins in a performance in New York's Central Park, where he'd played guitar with a reading that Pulitzer Prize winning author Robert Olen Butler gave called "Three Ways to Die in the '50s." That evolved into the bluesy King Kong Goes to Tallahassee. The title is partly a reference to Butler, who lives not far from Tallahassee in the Florida Panhandle, and to Ottawa poet Bill Hawkins, who was a mentor to Cockburn in the 1960s when he first started writing songs. Says Cockburn: "Bill wrote a series of poems that featured King Kong going to various places and always getting into trouble, so the title is also something of a tribute to him." Rise and Fall, is a piece that was previously only available on the Japanese edition of 1999's Breakfast in New Orleans, Dinner in Timbuktu.